From the neon tubes of theater marquees to your desk lamp at work, from the million-watt glare of sports stadiums to the nightlight faintly glowing in your child’s bedroom, it’s impossible to imagine the modern world without artificial lighting. 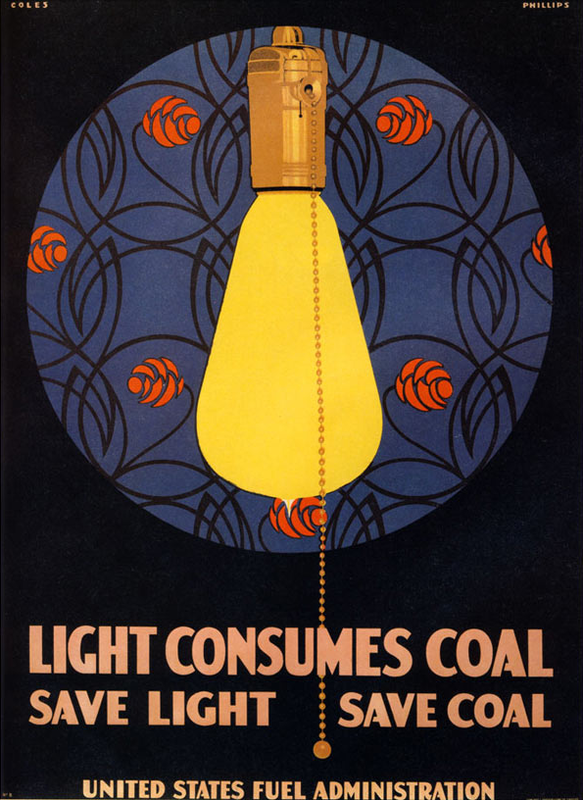 More than a century after the widespread adoption of electricity, it’s clear that our lust for light bulbs brought us into the future: The desire for incandescent lighting resulted in the creation of America’s electric grid, which improved communication, health care, manufacturing, transportation, and education. Accessible electricity also made every subsequent tech boom possible, paving the way for computers and the Internet. The lowly light bulb’s profound impact turned it into the universal symbol for innovation—yet despite the bulb’s storied legacy and Thomas Edison’s near-mythical status, for most people, that leap from fickle flame to unwavering electric light is vague at best. Even as antique-style Edison bulbs proliferate in trendy bars and restaurants, most of us know next to nothing about this revolutionary little lamp, the details of its delicate design hidden in shadow. During the early 19th century, natural gas, kerosene, and whale oil all provided fuel for lighting homes and businesses. In particular, the gas industry had invested in extensive pipe infrastructure to light offices, public institutions, streets, and homes. Though widely used, these methods were dirty and dangerous, and their light wasn’t much stronger than the flame of a candle. 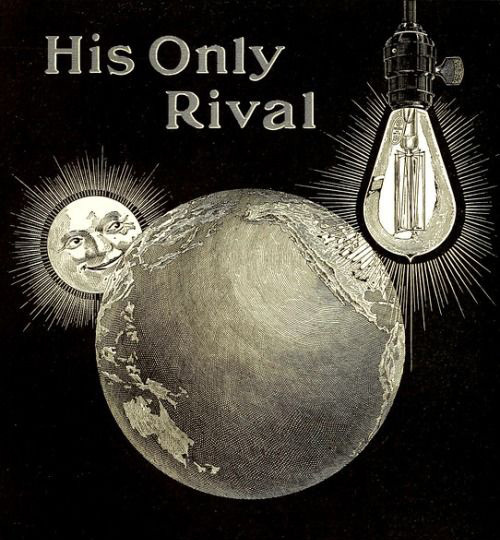 Top: A 1909 advertisement for General Electric’s Mazda light bulbs, which were based on Edison’s designs. Above: A 1929 replica of Edison’s incandescent prototype from the early 1880s. While many scientists worked on viable ways to manufacture and store electric energy, Sir Humphry Davy began demonstrating so-called “arc lamps,” which create a brilliant curve of electric light in the air between two electrodes, or carbon rods. Davy also experimented with the process of incandescence, whereby an electrical current passing through a wire filament makes it hot enough to glow. However, since arc lighting was around 200 times brighter than incandescents, the former quickly became the most likely contender for a modern light source. Davy wasn’t interested in turning his experiments into commercial products, but others certainly were. An American named Charles F. Brush had tweaked the arc-lamp design to create a cheaper and more reliable electric light, along with an improved dynamo, or electric generator, both of which he unveiled by lighting Cleveland’s public square in April of 1879. On July 4th of that year, Brush used 16 arc lamps to light Niagara Falls, a feat that one paper mistakenly reported was accomplished by Edison (who was famously known as the “Wizard of Menlo Park” for his work on the telegraph and phonograph at his lab in Menlo Park, New Jersey). A variety of Brush products from the early 1880s. Via Wikimedia Commons. 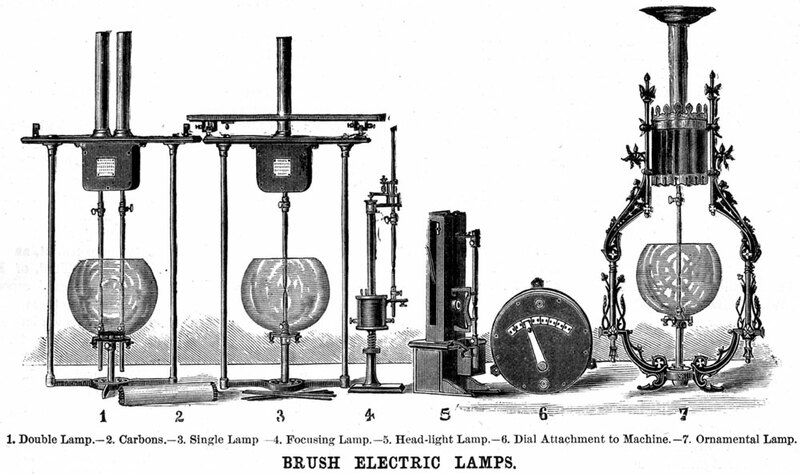 The following year, the Brush Electric Company began selling 16-lamp sets of these impressive arc lights and their requisite generators. Because they were so bright, the lamps were mostly used in huge factories, retail settings, or outdoor public spaces like the Great White Way, an illuminated section of Broadway between Madison Square and Union Square in New York City. Their most obvious benefits were seen in industrial spaces, where electric light increased potential production hours into the night, yet also improved employee safety. 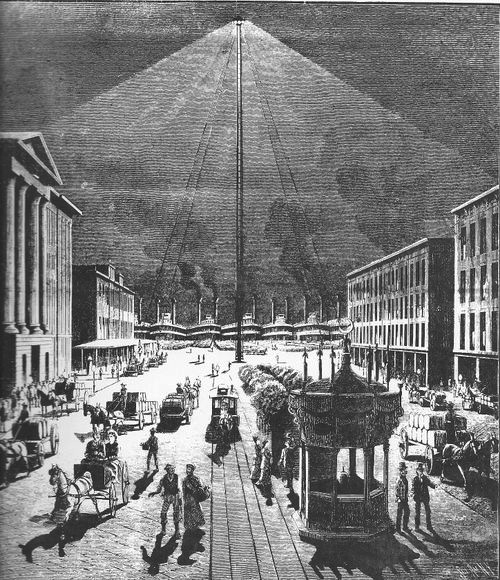 An illustration of arc lighting on the New Orleans waterfront in the late 19th century. After a trial run, many realized that electric light was pricier than gas, but residents were willing to pay for the improved light and its purported safety benefits. Others simply wanted to maintain their town’s relevance after neighboring municipalities adopted the technology. 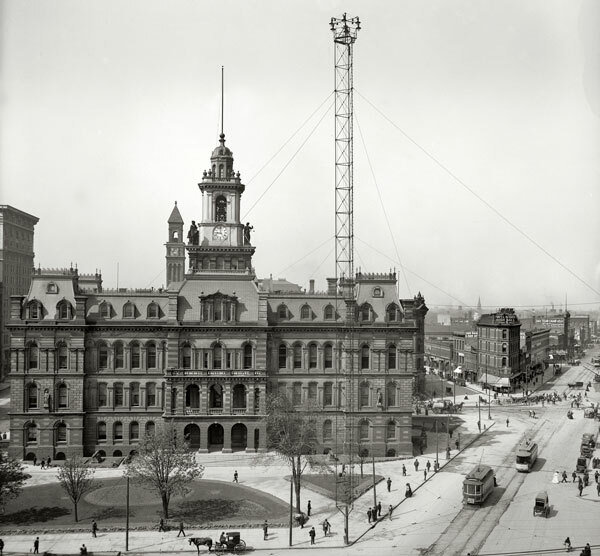 An arc-light tower rises over Detroit’s City Hall, circa 1905. Via Shorpy. Jenkins says there were four major issues with electric light that scientists like Edison were attempting to tackle, the first being which material made the best filament. In the late 1870s, the English physicist Sir Joseph Wilson Swan had built a working incandescent prototype using carbonized sewing thread as a filament. Within a few years, Swan’s home became the world’s first to be outfitted with incandescent bulbs (Swan’s American patents were later acquired by Brush). 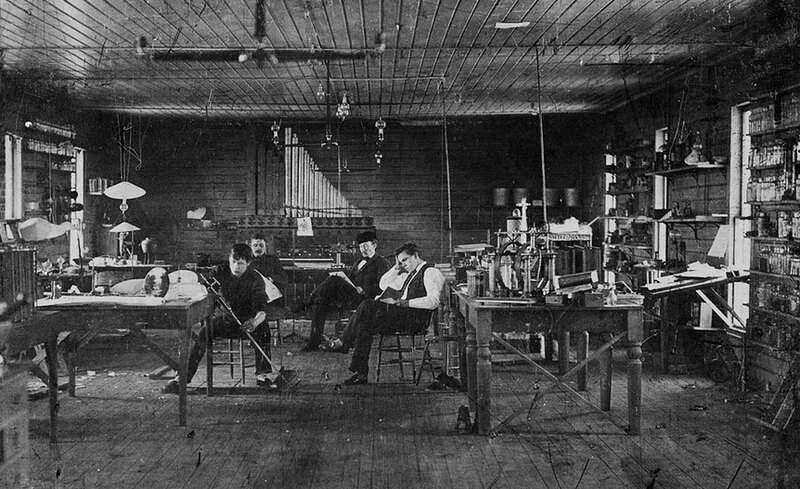 Edison’s assistants in his Menlo Park, New Jersey, lab circa 1880. Via the Museum of Innovation and Science in Schenectady, New York. The second major hurdle involved protecting the filament from oxygen in the air so it wouldn’t overheat and burn itself up; this was accomplished by sealing it inside a vacuumed chamber created in a clear glass bulb. To improve his vacuum technology, Edison sought out a German glassblower named Ludwig Boehm, who had been making Geissler tubes (a predecessor to neon lights), which required a special mercury vacuum pump. The pump was made from a glass cylinder more than 6 feet tall and a few inches in diameter, divided in half by a valve. With the valve closed, mercury would be poured into the top half, which was connected to the light bulb via a small hose. To evacuate the lamp, you’d open the dividing valve, and as mercury flowed into the bottom half of the cylinder, it would create a powerful vacuum, sucking the air out of the light bulb. Left, an 1880 patent for Edison’s incandescent bulb. Right, Thomas Edison (far right) and his associate, Francis Jehl, demonstrate the use of a mercury vacuum pump in 1929, the 50th anniversary of Edison’s famous light-bulb reveal. The final problem was preventing the wires connecting the filament to a power source from cracking the glass bulb near their point of entry. “As the glass heated and cooled around those wires, it would crack and destroy the vacuum, dramatically reducing the life of these lamps,” Jenkins explains. “Edison’s first bulbs only burned 15 hours anyway, so it wasn’t an issue for those. Later, his researchers realized that the electrical resistance of platinum is significantly lower than copper, so there is much less heat produced. They figured if they used platinum, there would be less expansion and contraction, so maybe they wouldn’t crack.” Sure enough, platinum lead-in wires solved the problem. 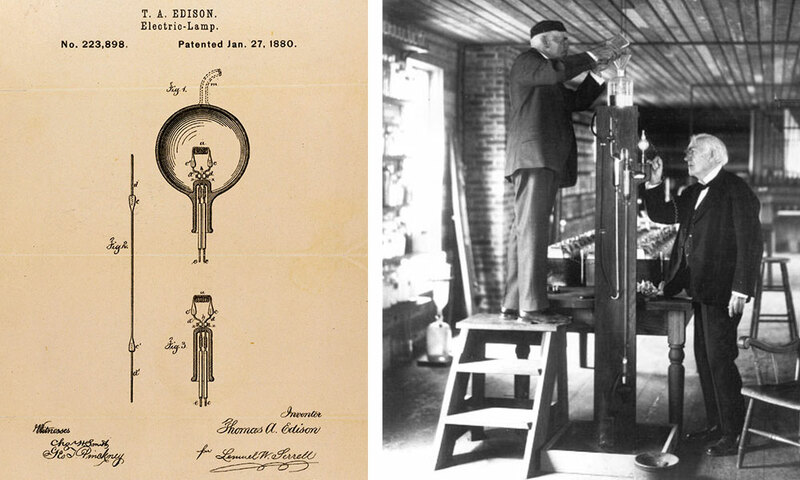 While these experiments with incandescent bulbs were taking place, many of Edison’s employees were also working to build a more efficient electric generator to power these lights. In late 1879, Edison finally opened his lab for a public demonstration of a new incandescent light bulb with a carbonized-cardboard filament, illuminated by a new kind of generator. Visitors were mesmerized by the soft glow of Edison’s lamps, describing them as “little globes of sunshine” and noting the distinct absence of smell. Though other inventors were skeptical of Edison’s electric-lighting technology, natural gas stocks plummeted after the big reveal. 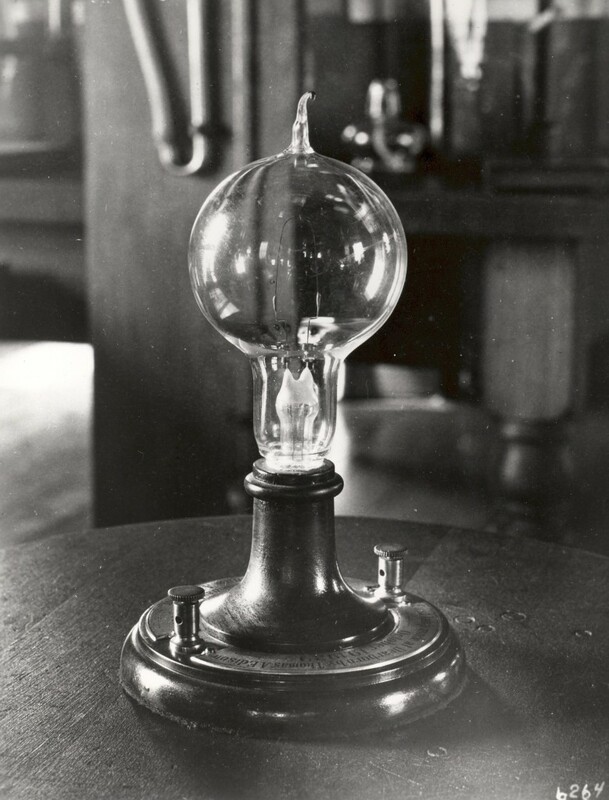 One of the two surviving bulbs from Edison’s 1879 demonstration, with a built-in hook for display. Courtesy the Spark Museum of Electrical Invention. 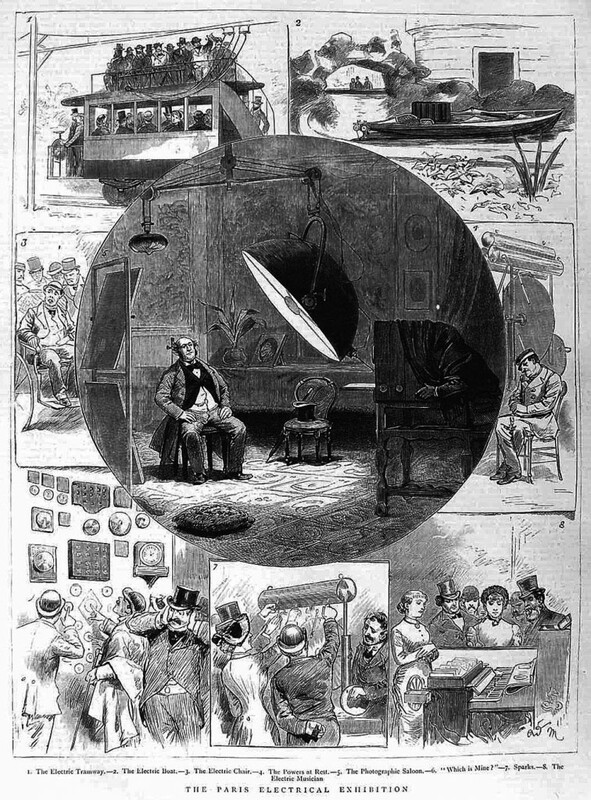 Illustrations from a British magazine called “The Graphic” featuring some of the impressive innovations shown at the Paris Exposition of Electricity in 1881. Though Edison clearly wasn’t the first to create a working incandescent bulb, he did imagine a more complete electric-lighting system, from power generation through a set of parallel circuits that could be subdivided among buildings and finally connected to switches controlling incandescent lamps in the home or workplace. “Edison didn’t just develop a lamp; he invented a whole system of creating and delivering electricity, including the dynamos, the wiring, the way of measuring the current, and the lamps themselves,” says Jenkins. Edison had soon established a group of companies that would manage each element of the process, making his arrangement the most obvious challenger to the gas-company empire. 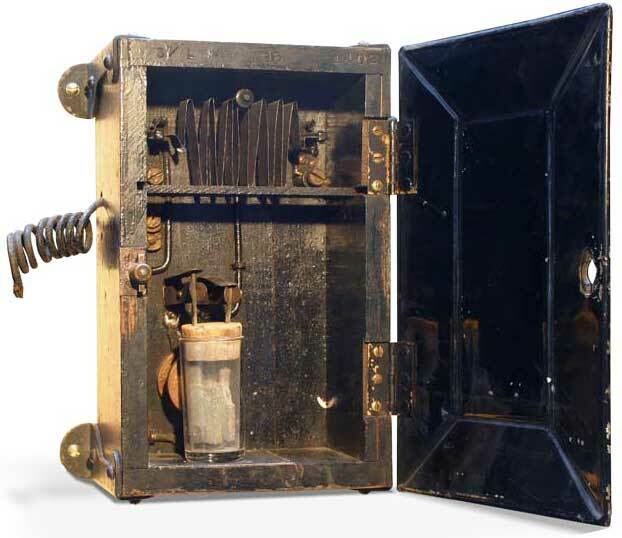 Edison also developed the first electric meter, which detected current usage by monitoring the transference of copper via electrolysis. Courtesy the Spark Museum of Electrical Invention. As Freeberg writes, most of Edison’s rivals had at least “a grudging admiration” for everything he’d accomplished. “But they also knew that the scientific principles behind electric lighting had been worked out across decades in many countries; that the crucial components of the lighting system likewise emerged from the insight and toil of many; that Edison’s own creations owed much to the talent and dedication of the team he had assembled at Menlo Park; and that several of his competitors had arrived at working systems almost simultaneously, in some cases holding key patents ahead of Edison.” Regardless, Edison was a cunning businessman with a knack for self-promotion, and he worked to make his name synonymous with electric power. 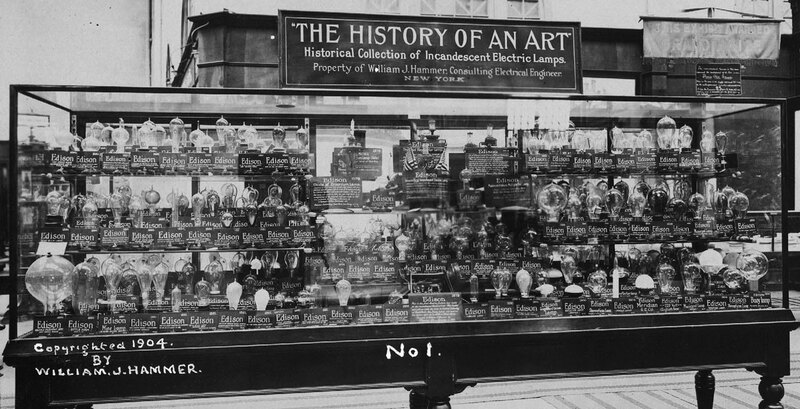 After the Paris exhibition, the electric-lighting industry exploded. At first, only the wealthiest could afford to adopt electricity in their homes, and even they only installed it in certain rooms. “In the 1882, three years after Edison’s first incandescent light bulb, if you had the money to get one area of your house electrified, that’s what you did,” says Alan Makkos, a collector and dealer of antique electric hardware. “You bought a generator system, and somebody came out and wired it for you and installed an electric light fixture somewhere in your home. But you didn’t jump right in, and suddenly have lights in every room in your house.” Like Tesla electric cars or Apple watches, light bulbs were suddenly status symbols of the tech-savvy rich. 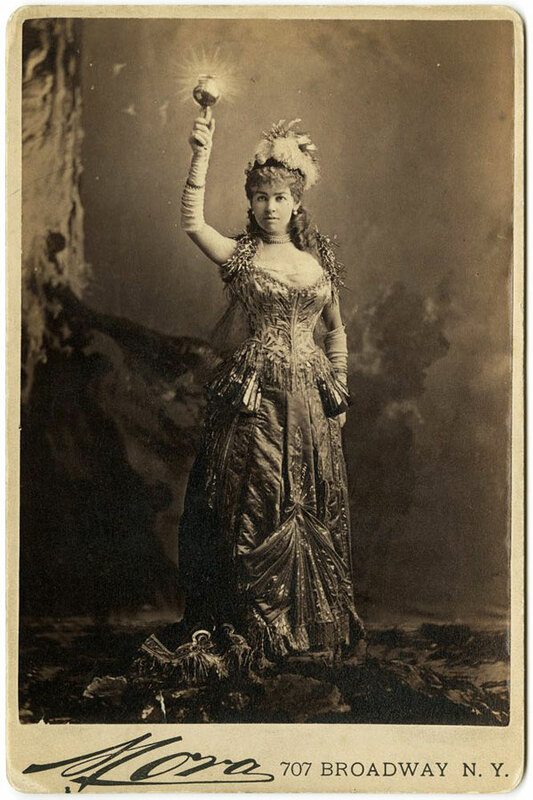 Alice Vanderbilt dressed as “Electric Light” for a costume ball in 1883. Left, an illustration of Edison’s Pearl Street Power Station from “Scientific American” in 1882. Right, The Centennial Bulb in a Livermore, California, firehouse has been in use since 1901. In 1882, Edison one-upped his competitors by completing the world’s first central power plant, Pearl Street Station, in lower Manhattan. The facility used coal to power several blocks of businesses, including the headquarters of several major newspapers and banks, plus the private homes of elite residents like William Henry Vanderbilt and J.P. Morgan. The project was an unparalleled success, and Edison set about replicating the system in every major city in America. This Westinghouse ad featured an illustration of Nikola Tesla’s powerful AC generator, circa 1880s. In dense communities, brighter electric lighting was applauded not only for eliminating most of the grime generated by gas and coal, but also as an antidote to crime through its supposed ability to expose inappropriate behavior after dark. Although electrical systems had their own fire issues due to faulty wiring, on the whole they were viewed as safer than the existing infrastructure of gas pipelines and smoky, flame-filled lamps. On top of providing plenty of potential clients, the density of urban areas also meant the limited reach of Edison’s direct current (DC) system wasn’t an issue, though power stations with heavy, expensive cables would need to be built every few blocks. 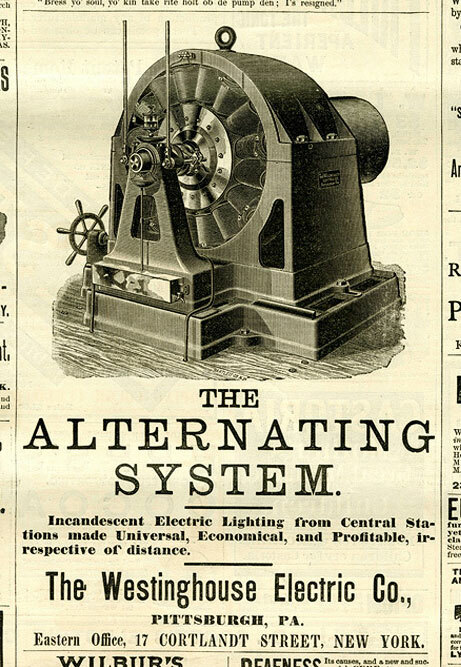 However, by the late 1880s, George Westinghouse’s alternating current (AC) system was a looming threat to Edison, as it could distribute power over hundreds of miles (and would eventually replace the DC model). The battle between Edison and Westinghouse became known as the “War of Currents,” which Edison fought by spreading misinformation on the dangers of AC power, even going so far as to design the world’s first electric chair using an AC system in order to tarnish its reputation. 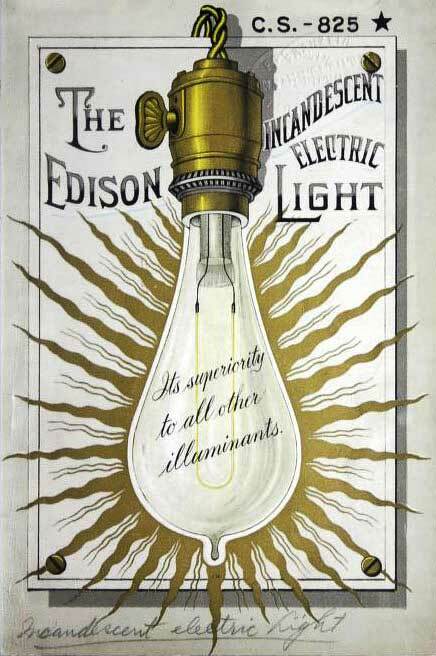 A boastful Edison catalog cover from 1887. Similar to the cutthroat tech world today, the electric industry was filled with drama, as upstart companies were acquired by a few giants (like when the Thomson-Houston Electric Company bought Brush’s pioneering business in 1889) and patent rights were purchased or challenged (Westinghouse bought several of Nikola Tesla’s patents, including many related to AC generation, even though Tesla had briefly worked for Edison). In order to avoid patent infringement and ensure their products weren’t interchangeable with their rival’s, major companies used different electric lamp designs. “The bulb, the bulb base, the socket that it fit into, the wiring receptacles—all of those would vary depending on the manufacturer,” explains Makkos. The incandescent bulbs that first brightened people’s homes and workplaces looked only slightly different than the incandescents we know today. 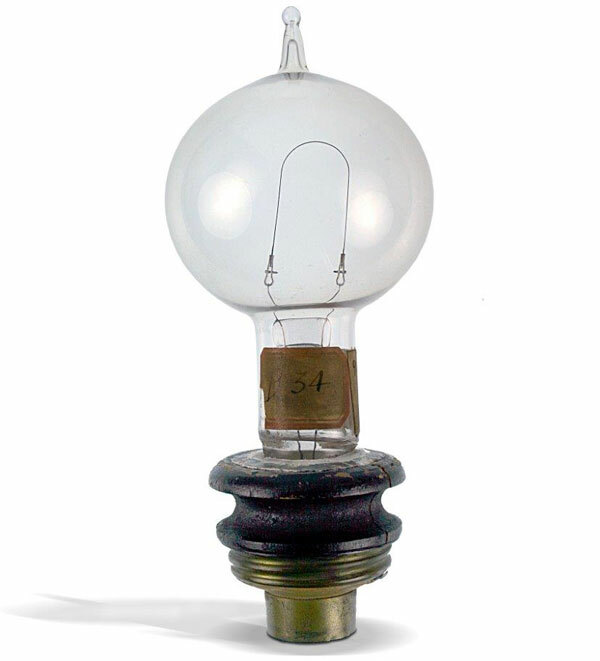 “Edison’s original lamp and its descendants were produced by heating and blowing into 1-inch-diameter glass tubing,” says Jenkins, “which would naturally take on a bulbous shape, like a baseball sitting on top of a tube.” Other bulbs were made with elongated glass envelopes in order to fit the longest possible filament, since developers believed that would produce a brighter light. On all early bulbs, the glass envelope was tipped with a small point left by the vacuum process, a feature that was later eliminated by vacuuming nearer to the base. As filament technology improved, the iconic, pear-shaped bulb we know today was adopted to streamline manufacturing and increase durability. Edison’s original screw-base prototype using a kerosene-can lid from 1880. Courtesy the Spark Museum of Electrical Invention. 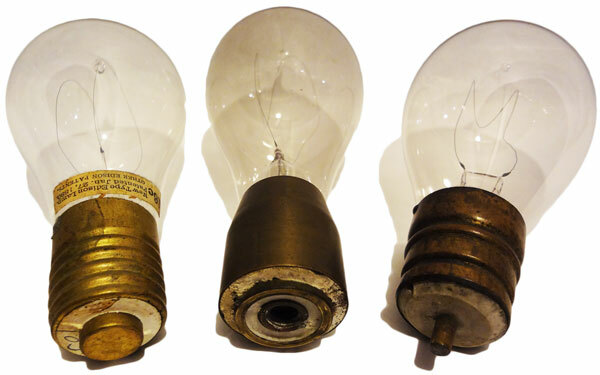 In the 1890s, the three most prominent bulb bases were made by, from left, Edison, Thomson-Houston, and Westinghouse. Courtesy Alan Makkos. In 1892, Edison’s company merged with Thomson-Houston to form General Electric, and Edison’s screw base became even more prevalent. Little more than a decade later, the Edison base was generally accepted as standard in the United States. Meanwhile, Edison had lost the fight over his DC system, particularly after Westinghouse was awarded the contract to build hydroelectric generators at Niagara Falls using Tesla’s AC patent in 1893. After the creation of General Electric, its new board of directors overrode Edison to kick-start the development of its own AC systems. For all their groundbreaking efforts, electric companies also built off older lighting methods in many ways: Before power was measured in watts, bulbs were rated by “candlepower,” an estimate of the lamp’s brightness when compared with a single candle. The fixtures these early bulbs fitted into were typically modified versions of existing gas lamps. “Electrical lighting design started off by using gas lighting parts—doing away with the valve and drilling through them to put wires in,” says Makkos. Since people were accustomed to striking a match near a doorway and wandering into a room to light a gas fixture, the first electric switches were installed near a lamp’s socket. “Which sounds great, except that you don’t have the match light to guide you, so finding your way into the middle of the room was a problem,” Jenkins points out. “In fact, the first time some inventor bumped his shin on an ottoman was probably when he got the idea of putting a wall switch in.” Convenient switches with push buttons or a rotary handle that turned the lights on from a wall by the door were soon an enviable luxury, and in 1896, Harvey Hubbell patented a socket with a pull-chain switch, a success to this day. As early as 1904, people like electrician William Hammer were collecting examples of early light bulbs that were fast becoming obsolete. As the power grid expanded, people also wanted greater flexibility from their electric systems: When items like electric fans and irons began appearing for sale in the early 20th century, users needed a novel way to connect them to their supply of electricity. “They ended up putting Edison-base plugs on them so they could screw them into a light socket,” says Jenkins. “If you wanted to use your iron, you had to climb up on a ladder, unscrew a light bulb, and screw this thing in. Not only did you lose your light when you plugged in your iron, but if you moved the iron around, the cord would get all twisted, and if you wanted to move into another room, well, you’d have to climb back up on the ladder, unplug it, screw it back in, and so on. It was ridiculous.” In his grand vision of an electrified future, Edison had overlooked the need for moveable electrical appliances that could be easily plugged into a home’s power system. Left, Hubbell’s 1904 patent for an Edison-base adaptor fitting a two-prong plug. Right, an Edison bulb with a tungsten “squirrel cage” filament, circa 1910. Courtesy Alan Makkos. 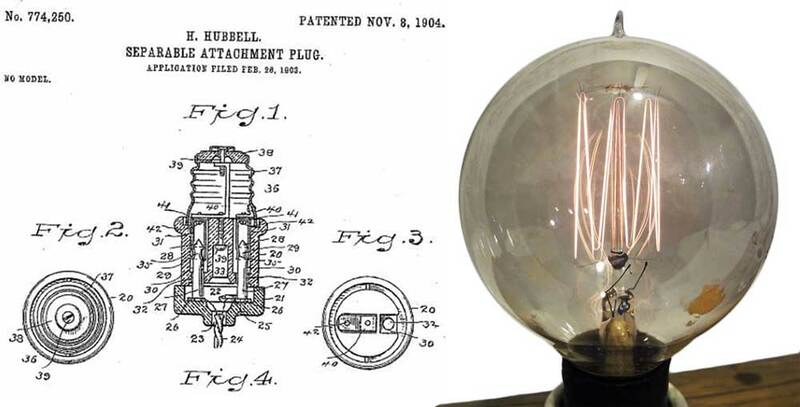 In 1904, Harvey Hubbell—of pull-chain socket fame—developed an adaptor for the Edison socket with holes for two flat prongs fitted for the first removable plug, now known as Type A. Although most homes used Edison-style sockets, the variety of adaptors and plugs continued to increase until 1915, when the National Electric Lighting Association (NELA) was formed to help determine industry standards. Two years later, NELA announced that the T-plug would be used as the standard going forward, as its slots would accept devices made with vertical or horizontal pins (this standard would change again in later years). By that time, incandescent bulbs pretty much resembled their modern selves: In 1904, a tungsten filament much more efficient than carbon had been introduced in Europe, and in 1906, a version was patented in the United States. Four years later, William Coolidge developed a ductile, or bendable, tungsten filament that was made by General Electric, and has been used for incandescent bulbs ever since. Shortly thereafter, Irving Langmuir discovered that filling the bulb with an inert gas and tightly coiling the filament also improved its efficiency. 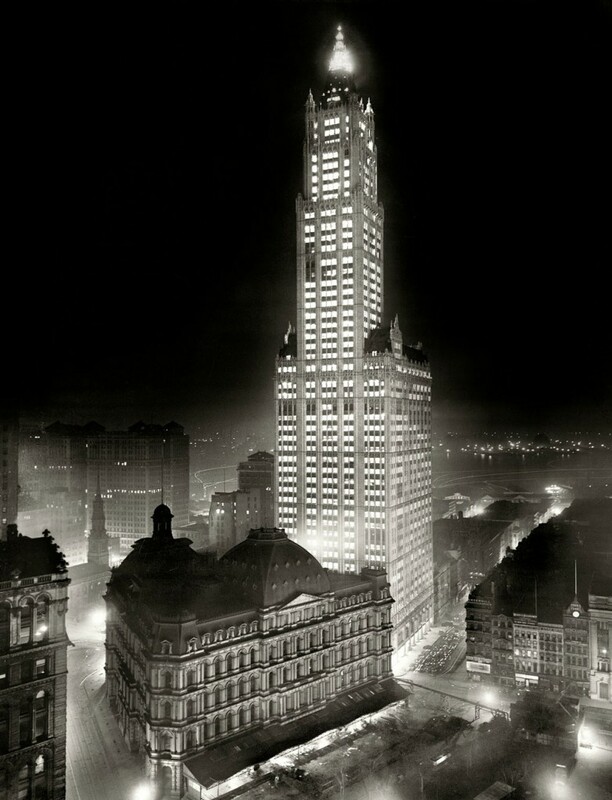 Seen in all its electrified glory when it was completed in 1913, New York’s tallest structure, the Woolworth Building, would have been unthinkable in an era without electricity. Via Shorpy. The transition to homes with electricity in every room really didn’t happen until after 1905, and even then, it was mostly in big cities that had the means of generating public power. Though most urban Americans had access to electricity by the 1930s, only around 10 percent of those living in rural areas did. Because private companies refused to cover the costs of expanding into less-populated regions, the Roosevelt administration established the Rural Electrification Administration in 1935, which created hundreds of rural electric cooperatives and encouraged the expansion of private utilities into these areas. But significantly, it was the public yearning for modern lighting that brought electricity to the masses, causing seismic shifts in our daily lives. Widespread electrification created the 24-hour workday, extending production hours into the darkness of night. Evening entertainment and social outings became routine rather than the exception. Sporting events could happen after dark, and people could invite friends over to drink cocktails and listen to phonograph records. 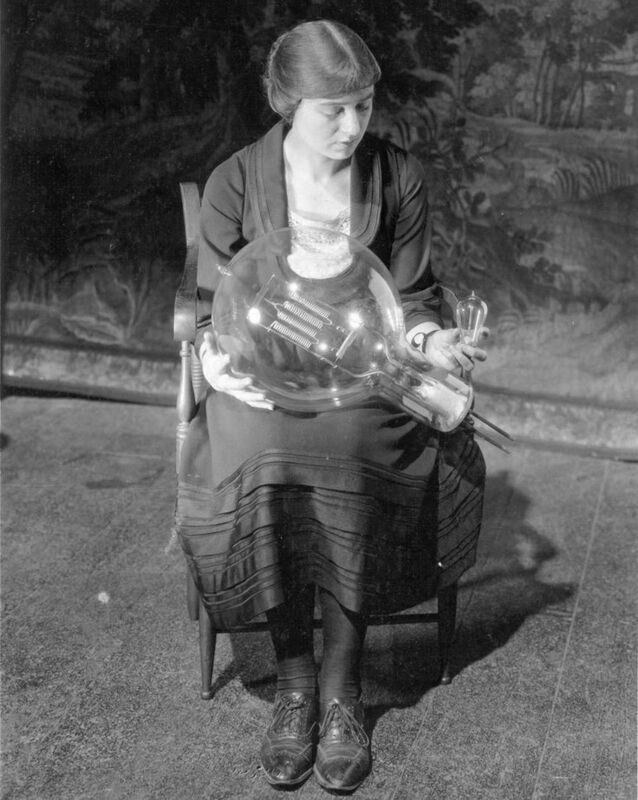 Actress Maude Adams worked with General Electric to develop improved lighting for theaters and movie sets, culminating in the creation of the world’s largest incandescent bulb, at 30,000 watts, which she compares with a standard 25-watt bulb, circa 1921. Though incandescent lighting undoubtedly changed the world, its limitations have also led us toward new lighting technologies. Half a century after its adoption, scientists still couldn’t convert more than 10 percent of an incandescent bulb’s energy to light—the rest generates heat—pushing researchers to look closer at alternatives, like fluorescent technology. Flash forward to 2007, when Congress passed the Energy Independence and Security Act, which mandated efficiency standards designed to phase out incandescent bulbs in favor of compact fluorescents (CFLs) or light-emitting diodes (LEDs). Even as incandescents become as retro as oil lamps, consumers continue to complain that the light from CFL and LED bulbs is too cold or harsh. Will they ever really replace the romantic glow of an Edison bulb? By World War I, the wastefulness of incandescent lighting was obvious. Great article!!! Best of its kind that I have read….and I have read a lot of articles on this subject. Without a doubt, the most exciting time in the history of innovation. And the drama! Oh, but that I could have been there to witness it. Behold!, the power and beauty of the incandescent cage bulb! With all the industrial lighting that I restore, I keep any of the working bulbs that I find… they can range from 200watt to 1,000watt! Interestingly, Kimberley – South Africa was the world’s first city to be planned around the availability of electricity. From diamond mining on an industrial scale to streetcars, arc welding in mine workshops, industrial refrigeration and domestic use – all by courtesy of the then De Beers diamond cartel. I was acquainted with one Johnny “Flatnose” van Rooyen whose grandfather had been instrumental, at De Beers behest, in bringing arc welding technology and training to the South African industrial base of that time. I have a 1000 watt Westinghouse Mazda Lamp with original box (not in good condition). It has been in our house for over 40 years and who knows how long before that (house built in 1939). Would like it to go to a collector. Know nothing about it but would like to find it a good home. “ ” Although the name 'mantiques' implies cool stuff for men, there’s really no limit to who can collect these things.